Time traveling has never brought Mark Montgomery anything but grief. And then, things get worse. And now, I’m handing over to Connie to tell us a bit more about writing time travel stories. As a writer of historical and time travel fiction, one of the greatest ironies I’ve discovered is that as radically different as other times and cultures are, people aren’t that different than we are. The trick to writing time travel is to remember that while the character’s hopes, desires, and problems are similar to ours, they must be shaped by the time they are set in. The culture of the time period must become a character and drives the narrative. In other words, what happens to the characters in Alexandria should be so defined by the time and place that the plot could never unfold like it does anywhere else. When I pick a time period, I research the culture and history, immersing myself in the significant people, places, foods, etc. I use small details like food, drink, clothing, and superstitions to convey a sense of the exotic and add verisimilitude. However, the places, people, and culture must propel the plot. For example, in Screwing Up Babylon, I needed a chase scene, and I knew it had to take place in the Hanging Gardens. So I envisioned myself as Mark trapped in the gardens and wondered, How can I escape? The answer was easy—by way of a man-made river that watered the garden. I ended up with a very authentic “waterslide” adventure inside Babylon’s Hanging Gardens. 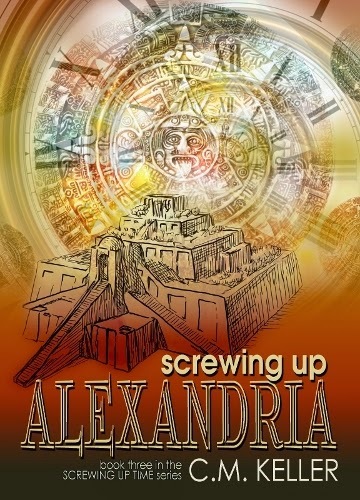 One of the great things setting the novels in Babylon, British Middle Ages, Alexandria, Mongolia, etc., is that it helps to keep a series fresh. There are always new characters and experiences, so creative options are endless. The hardest thing about time travel fiction is the language barrier. There is no way to give your characters facility in various languages. My main character Mark, who is seventeen when the series starts, does not/cannot know ancient Greek, Akkadian, Sumerian, etc. So, I’ve had to find ways to allow him to communicate and establish relationships with other characters without knowing the languages. One way I did this was through the use of other time travelers, people with more language abilities. But I wanted to be very careful with this and not use it as a deus-ex-machina answer to Mark’s problem. So I gave the other time travelers their own agendas, and they are at least as unhelpful as they are helpful, which made them wonderful to write. (I have a soft spot for tough, witty characters.) Another way I dealt with the language problem was by realizing it wasn’t really a problem. The places where Mark travels are not backwaters. These cities are cosmopolitan, cultural crossroads. It wouldn’t be unusual for people without a common language to encounter each other. So I spent a lot of time figuring out how to communicate without words. A reader once commented that it wasn’t until after she finished the book that she realized that Mark had never once spoken directly to the Babylonians. So I guess it worked. I’d love to hear your thoughts, comments, questions, or ideas. Thanks, Misha, for this opportunity to talk about time travel writing! 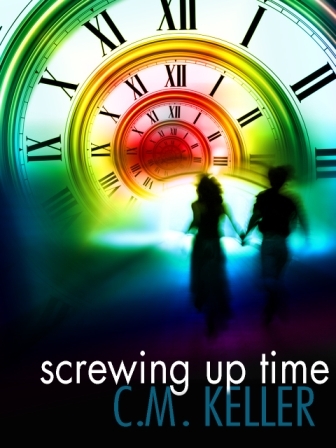 C. M. Keller is an award-winning novelist and the author of the SCREWING UP TIME series. She loves old movies and poison rings. In her spare time, she searches for that elusive unicorn horn. She’s currently hard at work on her next YA novel, the fourth book in Mark and Miranda’s story. Thanks so much for stopping by, Connie!